Techies Sphere: How to create NIC Team in Windows Server 2012 R2 ? How to create NIC Team in Windows Server 2012 R2 ? Or, Understanding NIC Teaming in Windows Servers. 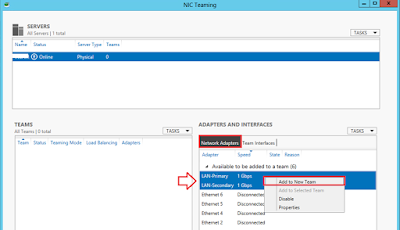 Or, Step by step guide for configuring NIC Teaming in windows servers with detailed explanation of available features and prerequisites. Or, Understanding “Additional Properties” and “Load Balancing Modes” of NIC Teaming in Windows Servers. You should plan for a downtime for at least 10-15 minutes. Because, when you create a NIC Team, the IP configuration of the server is required to be configured again on the logical NIC Team adapter and your server might get inaccessible just after creating the NIC Team because it has not IP configurations on the newly created NIC Team adapter. If you are doing for a Physical Server, you must be having physical access of the server. 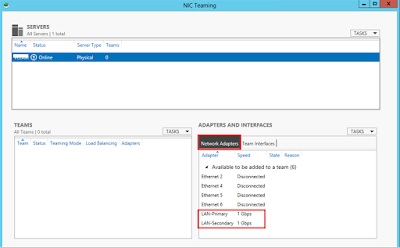 Because, when NIC Team creation wizard completes, the IP configuration of the server get erased from the Ethernet adapter and the newly created NIC Team adapter has no IP configurations at that time. 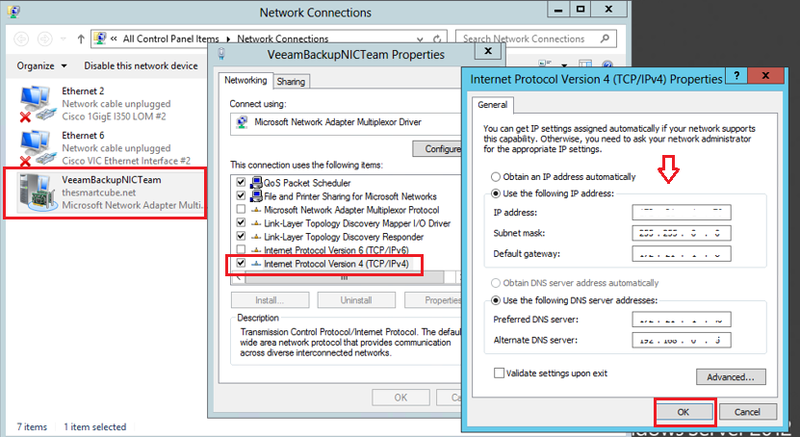 So, its simple you don’t have any method to connect to the server if you don’t have any IP configurations inside. Yes, you are lucky if you have something like Management IP separately for this server which can allow you to access your server KVM console remotely, else it better you have physical access of the server. NIC Teaming is one of the cool feature of Windows Serves which allows you to achieve high speed, redundant Ethernet card requirements when your some specific applications or servers deadly needs it. 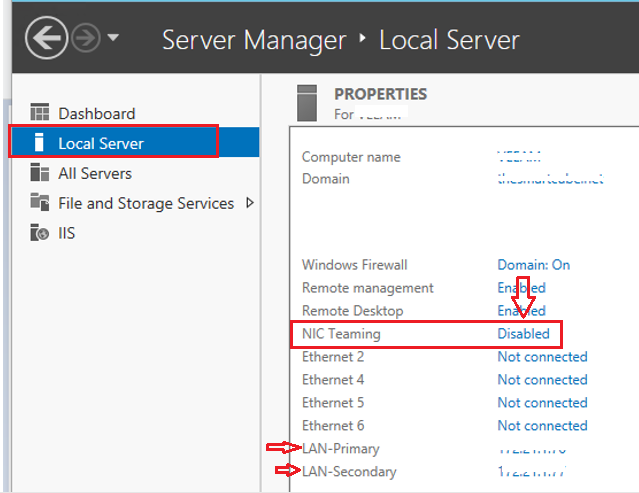 Open Server Manager console > Go to Local Server option > On the NIC Teaming option, Click on Disabled highlighted Hyperlink (as shown in the below screenshot). 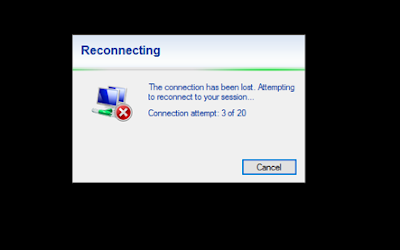 You may see below pop-up (connection has been lost) window. You remember the perquisites I explained above? Now try to gain access of the server console locally (I accessed it using KVM console in my case). 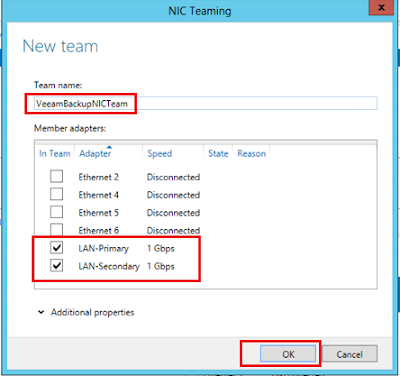 Please Note: the IP address you will configure here for your NIC Team Logical Network Adapter, the same IP will be used as Server IP going forward for this particular server. That’s it, you are done. But, if you want to do/check some more configuration settings, you can navigate through NIC Team properties from the Server Manager console. As you can see in the below screenshot, I have used my both NIC adapters in Active-Active mode. To understand more about this features, please see below descriptions. Switch Independent: The very first option on the list is the teaming mode. The default option is Switch Independent mode which lets you build a NIC team without having to be worried about your network switches capability and compatibilities. Static Teaming: This teaming mode is a switch dependent mode. This mode requires you to configure both computer and the network switch in order to identify the links that help to build a team. Switch Dependent: This is known as LACP, and it is based on link aggregation fundamentals. 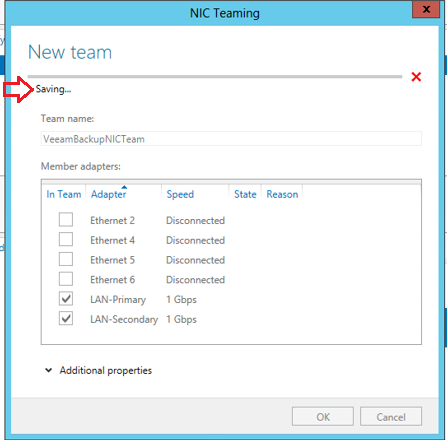 By using this type of NIC teaming you can dynamically reconfigure the NIC team by adding or removing NICs as your requirements. 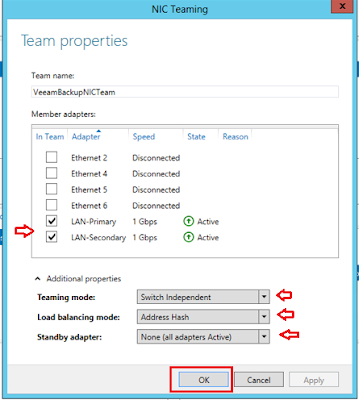 There are two type of Load balancing mode are available a) Address Hash and b) Hyper-V port. The Address Hash option is the most commonly used load balancing option as it allows traffic to be load balanced across all of the NICs in the team. The Hyper-V Port option balances traffic per virtual machine basis method. 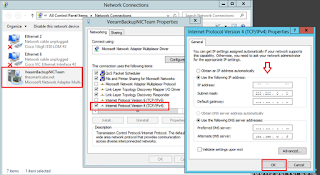 This load balancing feature helps dedicating each virtual machine’s traffic to a specific NIC. 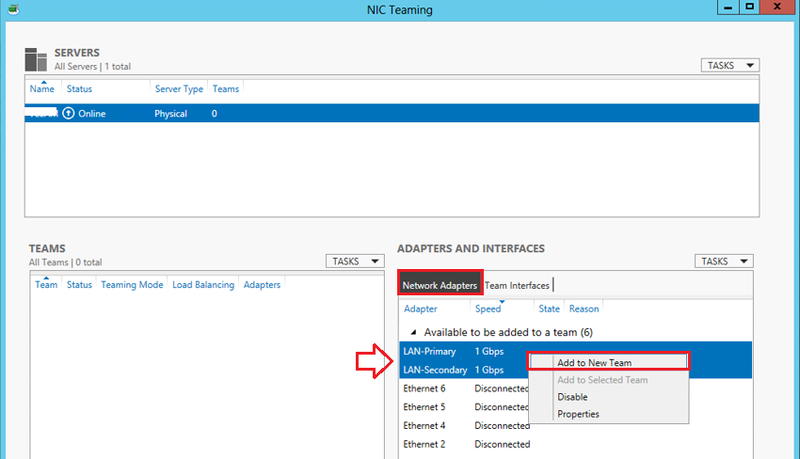 The name of the feature is self-explanatory; this feature allows you to decide which network you want to be acting as a load balancing network adapter in the logical NIC Team you have created. Choosing this option, keeps your one NIC in standby mode and another in active mode. The Standby NIC comes in active mode automatically when the primary active NIC fails due to any reason. Cheers, Please write me back if you have any query, feedback or suggestion on this..